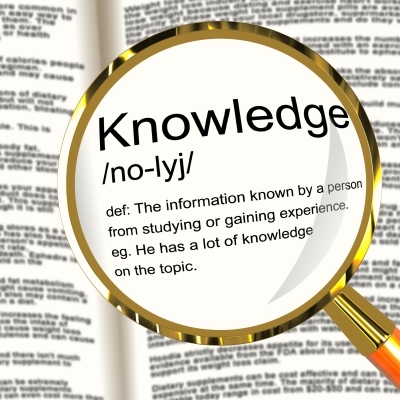 It was interesting to see 2 posts in my blogosphere last week about using wiki’s for enterprise acronyms, one from Mark Morrell and one from Thoughtfarmer. However, I still totally disagree with using a wiki for the company glossary. The main reason: you do not want everyone to be able to change official descriptions. Here’s how I created a departmental glossary. Some time ago I had the opportunity to create a “dictionary” for a department. 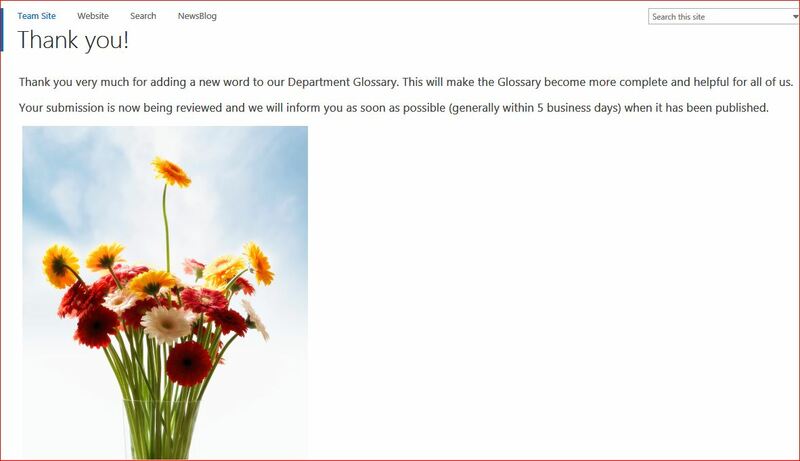 The common desire for a glossary arose from surveying the department’s employees and others. The survey dealt with the use, needs and wishes for their part of the intranet, which had pockets of heavily used sites, but overall management and maintenance had been a little neglected over time. I asked the volunteers by email if they wanted to enter any suggestions directly into the list ( I added the link of course), or send them to me by email. The next day, 60 acronyms were in the list (one person entered 40!) and over the next days, more suggestions came in. We ended up with over 150 items. With some minor changes made, I templated the list and recreated it in its final location, gave everyone permissions to add (not edit or delete!) 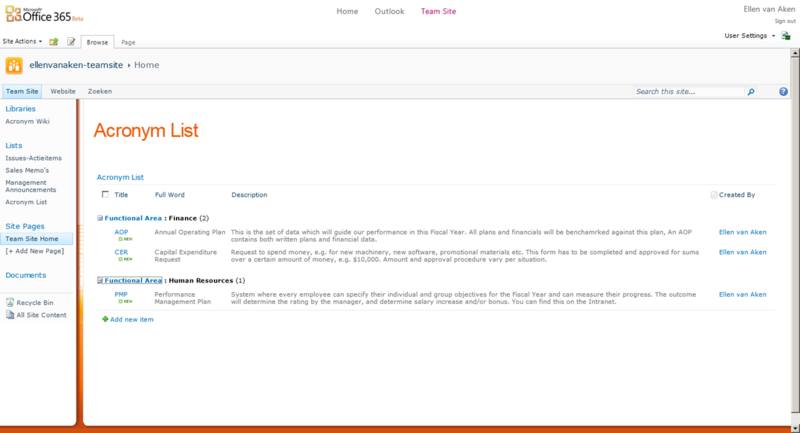 and added standard SharePoint content approval. I added some text about adding suggestions, and created a “Thank You page” for when someone had saved their new suggestion. That page also explained about the content approval. I created a separate list for onboarding new employees, using a filter on “New hire = Yes”. Over time, I approved or added some more entries when new ones were suggested. The information required to add a new item to the Glossary. This is the final page. Please click to enlarge. I do not have a Tab web part, so please imagine that A -E is a Tab and that other Tabs are next to it. I think I was lucky to have a few people of the sharing kind in my group of volunteers, so it was all done pretty quickly. The list is still there and people are still using it, I noticed from the usage statistics. And I really think this is the best option for this type of content! a. Create and configure a new page in the Pages library. Copy the URL of the page and paste it in a text editor. b. 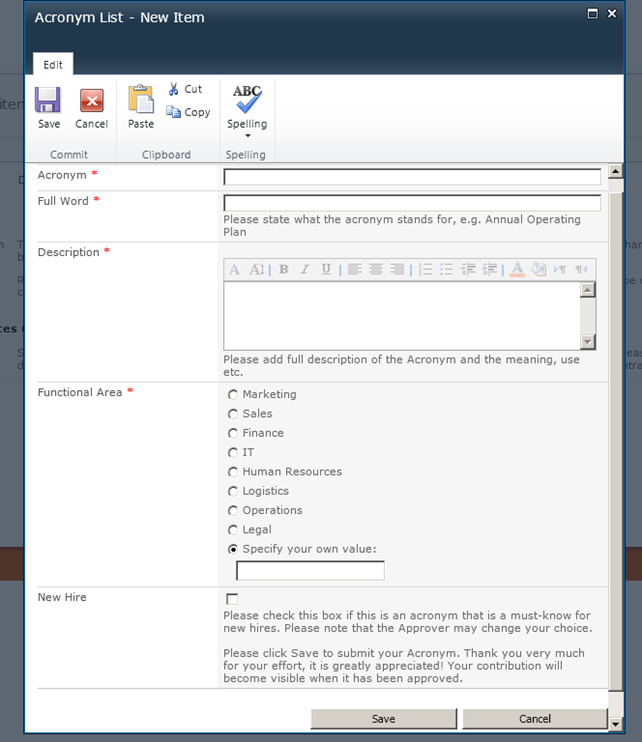 On the “Advanced Settings” page for the list, specify that forms are not opened in a Dialog Box. f. When people click “Save” after entering a new suggestion, their item will be saved and the Thank You page will open. This is the Thank You page. Simple but nice – at least I think so! Have you done it the same way or do you prefer a wiki? This must sound familiar to all Intranet and Digital Workplace Managers. And yes, we too have received the question often enough: where is the list and the explanation? And while the explanations are not the problem, making the list is the largest hurdle because generally, nobody feels responsible. So, could we solve this by using a Wiki and asking everyone to contribute their own acronyms? Wiki’s are meant to collaborate on content, so that seems perfect, right? Well, I dare to disagree with you! I know I am a Sharepoint List addict, so yes, I am biased, but I will prove that a Custom List is better! Read on! 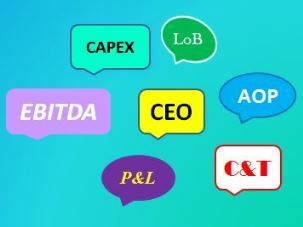 While collecting the list of acronyms is a collective effort, the description of the acronym is generally static. It is generally defined very concisely, and the description will not be changed very often. In fact, I do not think you would want all your employees to be changing your well-defined texts describing the required content and usage of your Annual Operating Plan, or the job description and responsibilities of your CEO! Therefore, I think you can collect this better in a Custom List. 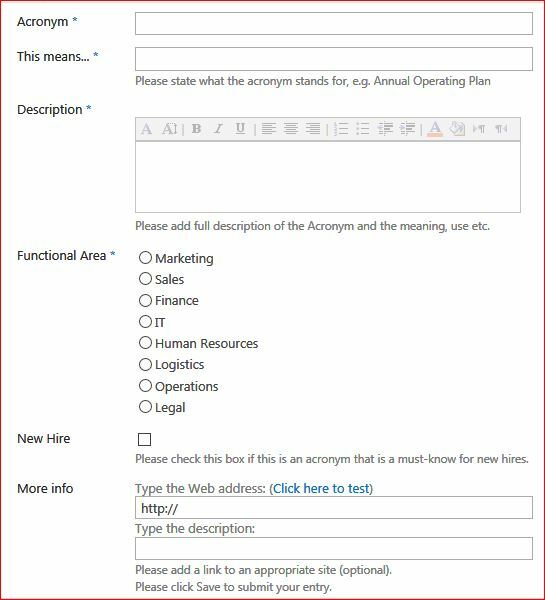 All employees can submit their acronyms and the description, and you can ask for additional metadata such as functional area, is this essential information for new hires, etc. This will allow you to group, sort and filter the list items in many different ways. You will find some screenshots attached. You may set approval to make sure that information is relevant and unique. That would mean there needs to be one person responsible, but his or her duties will be limited to checking, nog creating and collecting. People will still be able to modify a description, but it will be less encouraging as with a Wiki, you can hide the edit options from the main view, and if you set an Alert, you will be able to quickly spot and solve any issue. Not convinced? Let me know and add your comments! The information required for a new entry. This is what the list could look like.